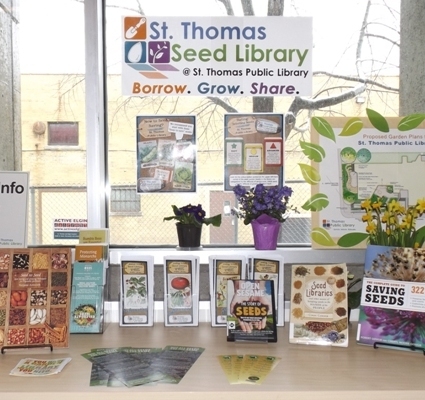 The St. Thomas Seed Library is a repository of open-pollinated (mainly heirloom) seeds which are held in trust for members of the St. Thomas Public Library. Members come to the library and borrow seed for their garden. They grow the plants in their garden and at the end of the season, they let a few plants ‘go to seed.’ From those plants, they collect seeds and return the same amount of seed (or more) as they borrowed at the beginning of the growing season. Seeds are free to members. The library is both a collection of seeds and a community of gardeners. Since seed is a living thing, it must be renewed each year somewhere by someone or unique varietals can become extinct. Even growing one seed and returning it to the library is a valuable contribution. Are you a member of the seed library? Please enjoy these free printable gardening journals to keep track of your progress. Remember to share your planting and harvesting stories with us! To educate our community in the importance of seed saving while fostering a culture of sharing, self-reliance, and community resilience, preserving and perpetuating Elgin County’s rich agrarian roots. Find the Seed Library in our online catalogue: Books on Gardening and Seed Saving & Upcoming Seed Library events!